Actually, it was my dream to have a picture of all the international couples I made thru Elena's Models. Now you can see just pictures of two these couples: Jim, Mariya, Ron, Olya. 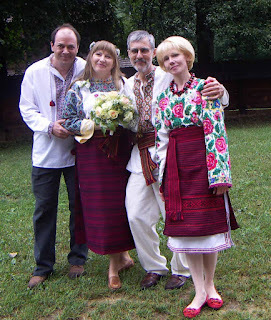 Picture was taken August 4, 2007 on Mariya and Ron's wedding in Lviv Museum of Folk Architecture and Culture. All of us in traditional Ukrainian costumes, in accordance with dress code of our wedding. So, our wedding was very special event not just for Ron and me, but for my best friend Olya and her fiance Jim too. In February 2007 I helped to Jim from Iowa (USA) and Olya from West Ukraine to find each other thru amazing dating site Elena's Models. After couple months of correspondence Jim decided to visit Olya in Ukraine. He planned to come to her in September, but in July I sent to Jim an invitation for Ron's and my wedding. I cannot to describe how I was happy when Jim changed his mind to visit Ukraine in September! He did everything in one night! During the night he booked a flight to Ukraine and hotel in Ternopil, and he answered, "Of course, I will come". More than that. In three days before the our wedding Jim asked Olya to marry him and Olya answered "Yes!". So we had two great events to celebrate: our wedding, Olya and Jim's engagement. Olya and Jim got married in August 2008 and their wedding was in Ukrainian style too. Good tradition!